The city of Porto is located along the Douro river estuary in Northern Portugal and is one Europe’s oldest cities. 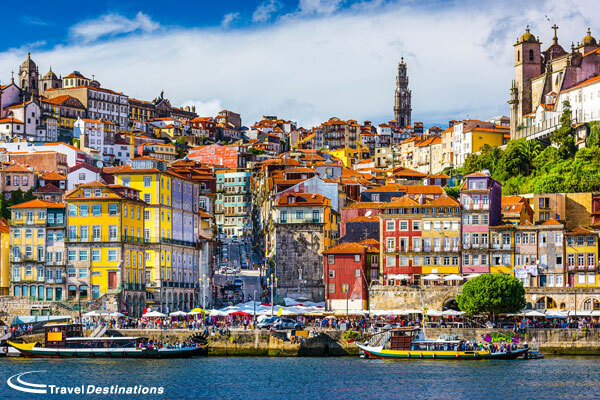 Its historical centre was proclaimed a World Heritage Site by UNESCO in 1996 and along with its port and wine production Porto is a fantastic place to spend a week – cruising the river, visiting vineyards, exploring its coastline – or just enjoying the Autumn sun. The base for our time in Porto will be a five-star riverside palace, built in the 19th century and now beautifully restored in to a contemporary hotel, whilst our journey through Spain will include stays at Parador and similarly characterful properties. The opportunity to join this unique JEC tour is available to a maximum of 15 cars, ensuring that you are able to enjoy the best of this JEC holiday, but because of this early booking is recommended. Check in at the Brittany Ferries terminal in Portsmouth for the 11:45hrs departure to Bilbao. A welcome dinner has been organised on board this evening. Arrive in Bilbao at 12.45hrs. After disembarking the ship take the drive through the Basque and Ebro wine region to Lerma and your base for 2 nights. Dinner is in the hotel restaurant. Following breakfast, why not spend the day in Burgos – a city twice laid siege by Wellington during the Napoleonic Wars, Burgos has the only Cathedral in Spain to be nominated a World Heritage site independently from the city and therein lies the tomb of El Cid. Burgos is also known as a gastronomic capital of Spain with lamb being the dish of choice. Leave Lerma and head through the farmlands of the Castile y Leon region to Salamanca – a beautiful city with architecture through the ages and a vibrant university culture. Dinner will be in the hotel restaurant. A free day to explore Salamanca. With a history dating back to the Celts, architecture from almost every era and a modern-day culture that fits seamlessly into this World Heritage site. Follow the beautiful winding route through the vineyards and heart of the Douro Valley and your next stop for 3 nights in a Quinta overlooking the Douro River. Dinner is in the hotel restaurant. A scenic road run and Port tasting experience. A free day to relax and explore the local towns and villages of Regua or Pinhao or visit one of the larger Port houses such as Sandemans or Taylors. A relaxing scenic drive along the Douro River to Porto and your luxury hotel for 5 nights. Dinner is in the hotel restaurant. This mornings river trip will take you up to the mouth of the river and return you back into the Vila Nova de Gaia area of Porto – home to the major Port houses as well as some independent producers, all offering tasting options. Saturday is a busy day in Porto but Bolhao Market is well worth a visit. It closes at 1pm so be sure to get there before lunch. It is a feast for the eyes as much as the palate with fruit and vegetables larger and more colourful than anywhere else, indulge in various cheese and port tastings, buy your souvenirs and treat yourself to fresh grilled sardines straight from the mornings catch. Why not take the train north to Guimaraes. Regarded as the original birthplace of Portugal and a town full of medieval buildings, cobbled streets and numerous parks and plazas. Or an hour south by train you’ll find Coimbra, the former capital of Portugal boasts Romanesque churches, baroque libraries and the melancholic, unique sound of ‘fado’ music. After a week of relaxation and exploration, it’s time to head back to the Spanish side of the Douro river and it’s own vineyards. A wine paring dinner is in the hotel restaurant. Take the beautiful scenic route down through the Picos de Europa to the Parador Cangas de Onis. Dinner is in the hotel restaurant. Driving distance approximately 190 miles. After breakfast head to Bilbao for your 15.30hrs departure to Portsmouth. We end the tour as we arrive at the Brittany Ferries terminal in Portsmouth at 14:15hrs. This 5-star hotel is set in a renovated 19th century palace overlooking the Douro River.